Sign today and show your support for Rachel Notley and Alberta's NDP. You can help Team Rachel reach more Albertans with a contribution of as little as $5. Any amount you can afford would be gratefully accepted. Would you like to contribute to the campaign? Keep up to date with us online. Volunteer today to support for Rachel Notley and Alberta's NDP. What would you like to help with? Placing a sign on your lawn or balcony is an important and valuable expression of your support for Rachel Notley and her team, and her vision for a Alberta's future. We appreciate your support very much! Are you able to make a $7 contribution to cover the costs of your sign? Yes, I can make a contribution. Your sign has been ordered! Do your part by spreading the word. 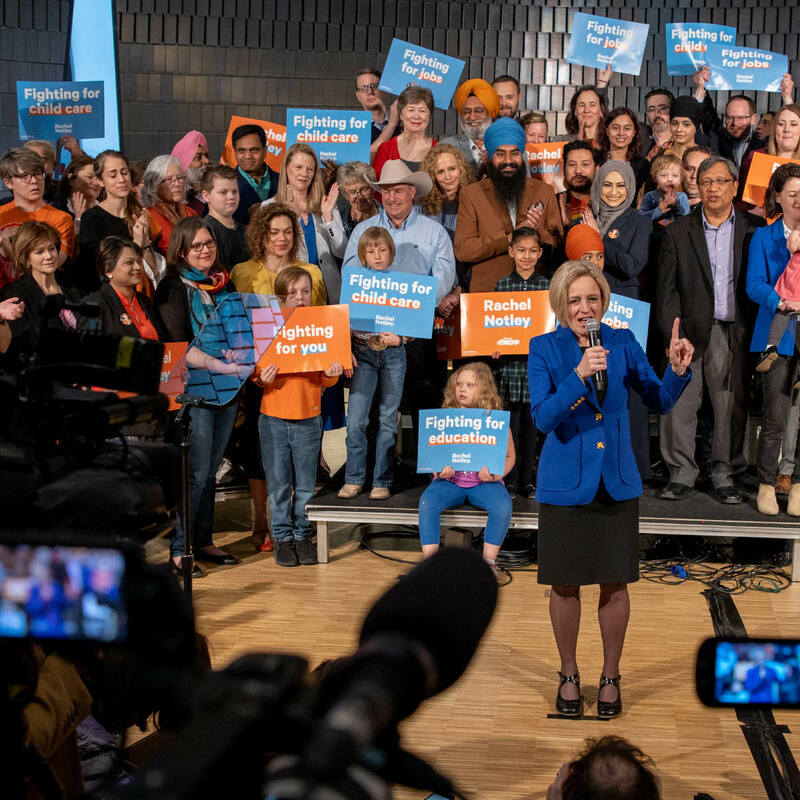 The coming election will be about who is fit to be Premier, Rachel Notley said Tuesday, announcing that Albertans will head to the polls on April 16. Notley described the choice as one Alberta versus a divided province where the wealthy take priority and the rest of the province is forced. “I want to build one Alberta,” Notley said. “Let’s keep fighting for a province that works for everyone, from adversity to recovery to shared prosperity." Notley promised to fight for god jobs, strong hospitals, good schools, and an economy that works for all Albertans. To workers and families in Calgary, Notley spoke about shared priorities including the Green Line, the Springbank dam and the long overdue Cancer Centre. She also spoke about a vision for one Alberta for all Albertans, whether conservative, moderate or progressive. Albertans can have a leader who fights for pipelines while standing up to the UCP’s desire for American-style health care. Notley pledged to build for the future, continuing down the path to the biggest economic diversification effort since the days of Premier Peter Lougheed. While Notley talked about a vision of Albertans working together, she warned that Jason Kenney wants to divide the province. Kenney’s vision is for two Albertas. One for the wealthy and one for the rest of us, one with rights for some people but not for others. But a record of intolerance has no place in the Premier’s office, said Notley. Notley also addressed the festering scandal that has engulfed Jason Kenney’s leadership in recent weeks. With an RCMP investigation underway, a growing number of conservatives are having serious doubts, she said. Although Kenney already appears to think he’s entitled to be Premier, Notley pledged to earn Calgarians’ and Albertans’ support over the next 28 days. The campaign will offer a choice about who is fit to be Premier of Alberta, but it will also be an opportunity for Albertans to show that we take care of each other. Will you join the movement for Alberta's future? Rachel Notley and her team have set the course for a future that is for all Albertans, not just a select few. There's no room to turn back and undo our progress. Sign up to today and join the fight for Alberta's future. Your time makes a difference. Every little bit helps to move us forward.